I have just purchased Ma An Shan raw pu-erh tea, one of the prestigious teas in my raw pu-erh tea line-ups. 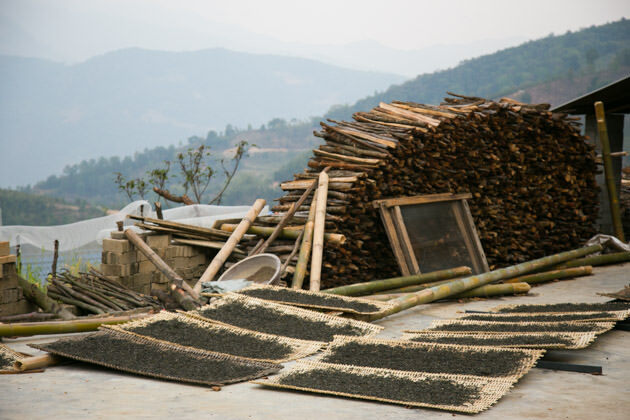 For sourcing pu-erh tea in Yunnan Province of China, I focus on Lincang where the altitude and latitude is higher than the south such as Meng Hai. In Lincang, there are four famous tea production areas: Xi Gui 昔帰, Bing Dao 冰島, Mang Fei 忙肺 and Ma An Shan 馬鞍山. Among these four places, Bing Dao and Xi Gui is located in the close distance from the city centre of Lincang as well as Lincang airport. Due to the easier accessibility, the number of tourists visiting these places is increasing. Recently, the price of tea in these two places is over speculated. Naturally, farmers in these places are becoming wealthy and eventually they are trying very hard to further increase the output too. Nowadays a lot of fertilizer is applied in these places and tea is plucked all over the year. 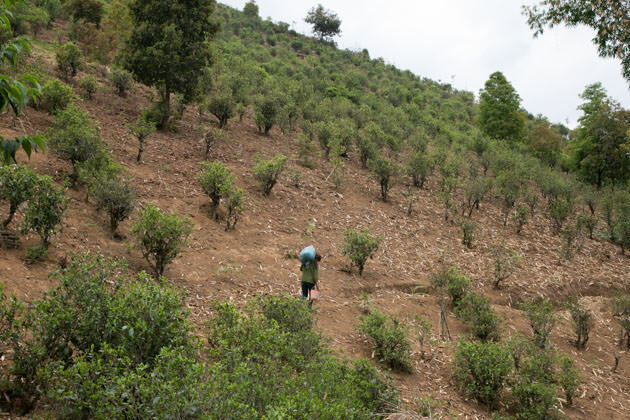 As a result, the quality is decreasing in general, unless tea is sourced from the surrounding areas. Out of 4 famous tea production areas in Lincang, Ma An Shan is located near the Myanmar border and it takes minimum 8 hours to reach there by car from Lincang city. Due to the very remote location, less people are going there and less people know the name of Ma An Shan. However, the quality of Ma An Shan is outstanding in general and its character is strongly pronouncing. 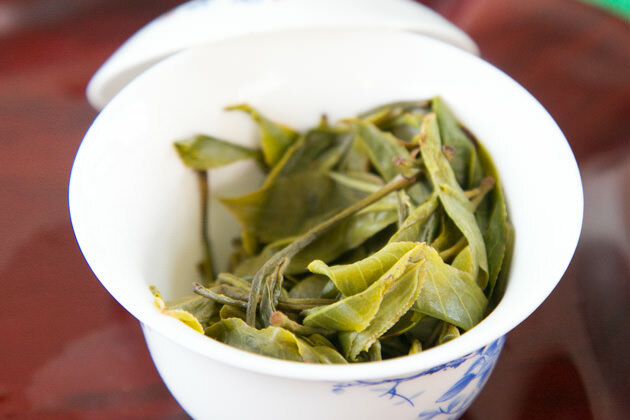 If you have ever tasted Ma An Shan, you may be impressed by its quality. I was very shocked too when I first tasted Ma An Shan. 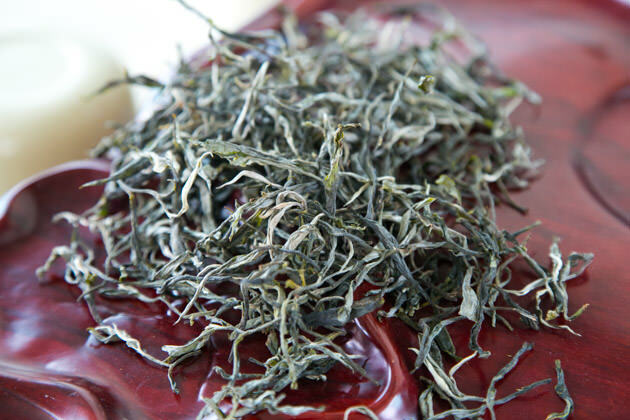 The main characteristics of Ma An Shan is its well-balanced taste and three-dimensional mouth-feel. It gives very strong body as well as deep aftertaste. You will enjoy not only the width in taste but also the depth when you sip Ma An Shan tea. My feeling when I tasted Ma An Shan tea is like taste exploded in my mouth. It is so rich that I felt sweetness both on my palate and down my throat too. The very famous tea in Yunnan such as Lao Ban Zhang and Xi Gui is known for the strong body. Ma An Shan tea has equally strong extent of body. But most importantly, Ma An Shan gives extremely strong aftertaste too thanks to its traditional natural farming practice. It is the tea that tea lover would always look for. 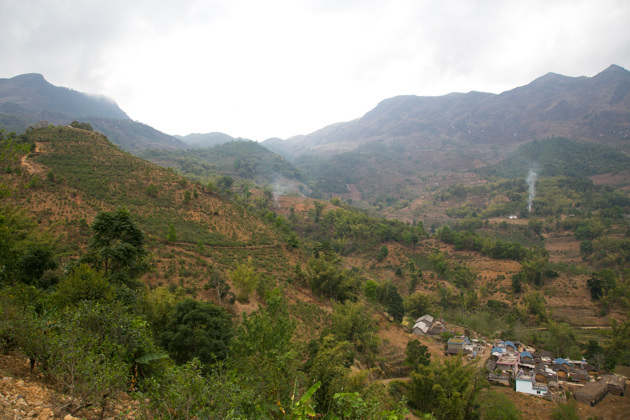 In fact, not all places in Ma An Shan practices natural farming. I noticed that some farmers are using fertilizer at certain tea growing areas. The fertilizer is speeding up the growth rate of tea tree and eventually the taste becomes lighter and thinner. The surface of tea tree grown with fertilizer becomes darker, the leaf turns greener and the leaf size also becomes bigger. 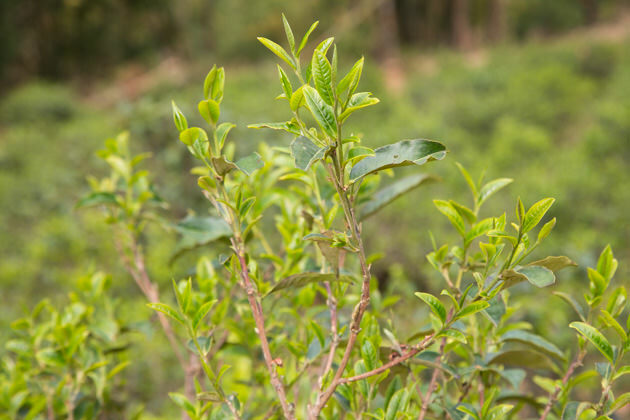 The natural farmed tea generally produces smaller leaf, less green and tea tree turns white. One of the important indexes is to survey the ground. If we see bare soil and no weeds are growing, it means fertilizer is being used. We specially selected the area where the farmer still practices natural farming. A farmer carrying the fertilizer to his tea garden. I always think it is very important to find the manufacturer who could clearly understand our quality requirement. I spent few days walking around the village to look for the reliable manufacturer. One of the manufacturers I met could understand and agree with all the points that I highlighted based on the tea he processed and could logically explain the root cause. 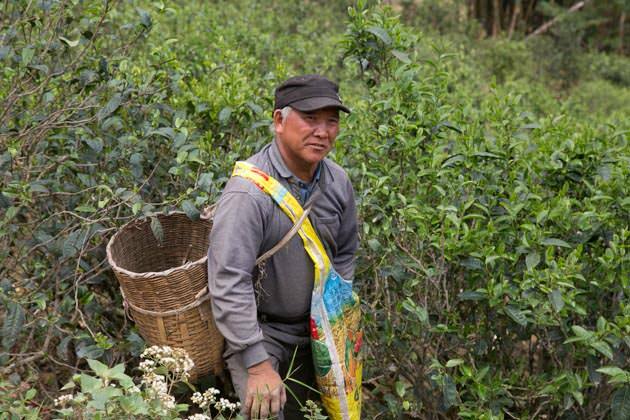 I also noticed that he was extremely particular when he is inspecting the fresh tea leaf delivered by farmer from his village. 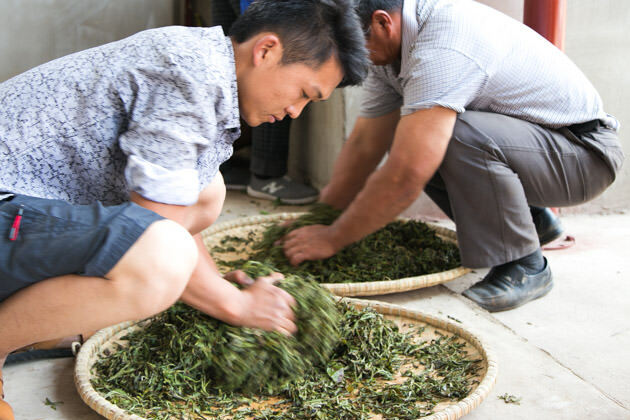 Looking at how much he cares about the quality of fresh tea leaves, I could understand his ability in quality management. However, the current quality of his tea was not up to my requirement. One of the reasons is that they have very less exposure to the buyer from outside. It is not they cannot do, but they have not thought it was important. We have gone through lengthy discussions with them, and requested them to process their tea following our requirements. A few days later, we received the sample that they processed according to my requirement. I was extremely pleased by the result. I was not only happy with the result but also the fact that they worked very hard and finally achieve it. I always think that the important element in sourcing tea is to find the reliable manufacturer. We need to select the person who is honest and willing to make an effort and logical approach to produce high quality tea. We are planning to compress Ma An Shan raw pu-erh tea into 200g cake this year. However, we also wish to introduce mao-cha since we have a lot of requirement from customers. Mao-cha gives more fruity notes like citrus or green grapes. This flavour remains even if it is matured. 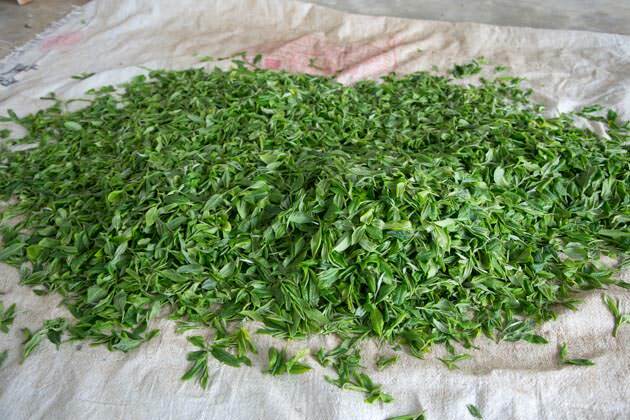 You may also consider keeping mao-cha for many years to enjoy the changes of tea maturation. Reservation is open for limite period until 3rd of April. I wish to compress tea in 2 weeks’ time. Thus, the reservation of Ma An Shan Mao Cha (loose tea) is available till 3rd of April. The estimated arrival of this tea is in May. Please contact our shop or send us an e-mail if you are interested. If you get 5 of either 100g or 300g, you will get one more for free. For example, if you get 300g x 5, you will get one more 300g.